Sometimes a friendly tap on the horn is all you need. Sometimes you need more. 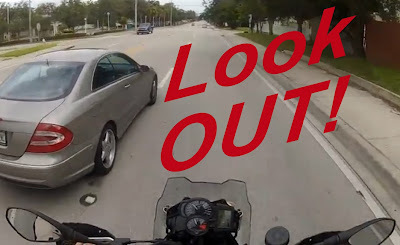 How about a motorcycle horn that beeps a friendly greeting but blasts a "GET OUT OF MY WAY" warning when danger looms? A company called Screaming Banshee has perfected just such a horn system, and will sell it to you for just about $100. They even think they thought of it first. Actually, I suggested exactly — almost, well, not quite — the same thing years ago. In a 2005 post on the Royal Enfield Yahoo group (you can look it up — it's message No. 39105) I suggested an internationally recognized panic warning sound that a rider could trigger with a second button when the motorcycle's standard horn wasn't enough. All Screaming Banshee has done is cleverly combine the RUN FOR YOUR LIFE noise with your motorcycle's existing sweet little horn button. You can pop the horn button for a pleasing toot or hold it down for .15 of a second and trigger a massive blast of sound — 139 decibels of it. The Screaming Banshee also can flash the motorcycle headlights, to increase the warning effect. The makers of Screaming Banshee credit the idea to Peter Olt, who came up with it in 2011 after a narrow escape when a car suddenly entered his lane. In a press release the company calls his idea "the first automatic loud horn and light warning system for motorcycles, scooters, cars, boats and snowmobiles." They give me no credit whatsoever. Screaming Banshee's website claims the system will work on any motorcycle with a 12-volt electrical system. Installation appears to be a matter of fitting the second (LOUD) horn and tapping into existing wiring. The air horn can draw 20 amps but it takes it directly from the battery. I found watching the video of Peter Olt installing the device on his own motorcycle the best explanation of how it works. I made my 2005 comment on the Royal Enfield Yahoo group in response to a discussion of whether air horns really make motorcycles safer. What if a clueless driver reacts by looking around for a tractor trailer and still misses the motorcycle? What if he panics at the sound blast and hits the gas instead of backing off? What about noise pollution? It seems to me that Screaming Banshee has found the fix: beep when it works, blast if you have to. "The whole point of our system is to provide a loud horn ONLY when it is really needed, and not to promote the excessive use of a very loud horn," the website notes. Disclaimer: I've never tried to install a Screaming Banshee on a Royal Enfield. In an online chat, the company's Greg Moore suggested their split-system version might be best for a Royal Enfield. I have no connection with the company and have accepted nothing from them. Frankly, the whole point of this blog post is simply to boast that I thought of it first!